The Tarot of Northern Shadows illustrated by Sylvia Gainsford (Tarot of the Old Path) is based mainly on the tales of The Mabinogion, a book of legends from Welsh folklore and history. The Major Arcana feature Norse and Celtic figures, with their attendant animals and runic symbols where appropriate. The minor arcana suits are: Rods which portray Norse gods and goddesses, Cups that feature heroes and heroines from The Mabinogion, Swords featuring characters from British Celtic legend and Discs that feature Irish Celtic personalities. 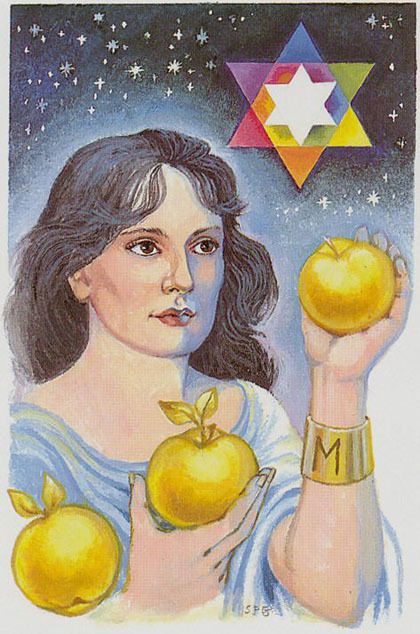 The Star card depicts a raven-tressed woman draped in white holding three golden apples. She is Idunna, whose magical fruit kept the gods young in Norse mythology.